Our land for seventeen generations. The history of our family and our business began between Menfi and Sambuca, and this is also where our journey commenced. We planted the first vines a short distance from the ancient Phoenician grape press on the edge of Lake Arancio, witness to the historic connection of this land to the cultivation of vines and the production of wine. We are in the heart of a magical place where a large number of the wide variety of unforgettable experiences which Sicily has to offer can be found; archaeology, history, culture and nature. In 1995 our journey in Sicily began here. Our first winery was built on the estate of Ulmo, and that of Dispensa is still the operational centre of the business. This land is good, with such proud beauty, agreeable to people and admired by so many, opulent with enviable possessions and rich in noble spirits. Our story and our journey began at Ulmo. In the middle of the 1980’s we planted our first vines around the 16th century farmhouse which the family has always owned; a beautiful place full of memories which we wanted to provide with a new future. We built our first winery in 1995 on the banks of the Lake Arancio and its nearby woods, in really delightful countryside. We also established the Iter Vitis museum, surrounded by a ‘Collection meadow’ of different Sicilian and Georgian vines, inspired by the idea of enhancing the rich Sicilian winemaking tradition. The nature footpath, La Segreta, leaves from the winery and leads to exploration of three more different paths which border the vineyards, discovering untouched corners and unexpected views. Hidden within the Menfi hills and with 160 hectares of vineyard, the Dispensa estate is the beating heart of all our activities. The family houses are within the Baglio, while around them lie our production, administrative and planning centres. The larger part of the company’s production takes place here, and we have built two wineries; the large and the small. The Infernotto, inside the small winery, is our family caveau, with a collection of our favourite labels from all over the world and all the Planeta vintages. Hidden within the Menfi hills and with 160 hectares of vineyard, the Dispensa estate is the beating heart of all our activities. The family houses are within the Baglio, while around them lie our production, administrative and planning centres. The larger part of the company’s production takes place here, and we have built two wineries; the large and the small. The Infernotto, inside the small winery, is our family caveau, with a collection of our favourite labels from all over the world and all the Planeta vintages. The Library holds hundreds of Italian and foreign books, from 1700 to the present day, all dedicated to vines and wine. From the sea to the hills, up to an altitude of 400 metres, the Menfi territory holds the largest extent of our vineyards. We cultivate more than 250 hectares, and we make careful selections of our vines, both indigenous and international varieties, to the specifics of each terroir. The valley was originally crossed by a river which today has become the Lake Arancio. This has contributed to the formation of deep soils, with an abundant texture of pebbles. The higher soils are instead more limey and chalky. The slope ensures perfect drainage. 200/350 metres above sea level. The soil is moderately chalky with abundant loamy sections. An extraordinary micro-climate exists with breezes coming from the sea which is only a few kilometres away. Medium depth, limey with mixed yellow and dark grey chalk, moderately fine texture. Little gravel is present, ideal for international grape varieties. 75/415 metres above sea level. Divided into two micro zones, one of them a mixture of red sand with little gravel, ideal for Syrah; the other characterised by limestone soil with much chalk, enhancing still more the particular aromatic qualities of Fiano. 75 metres above sea level. We planted our first vines at Menfi and our most representative wines are produced here; the Planeta Chardonnay, the company’s great classic, a single-variety wine and super cru, and also La Segreta Bianco and Rosso, the labels of everyday drinking which bear the name of the woods which surrounded the Ulmo estate. This was the first vine we planted in 1985 in the Ulmo and Maroccoli vineyards, unique in their aspect and the characteristics of the terroir. It represents our history and also the vocation of our wine production, with the intention of recovering local varieties but also to demonstrate the extraordinary adaptability of the great international varieties to Sicilian soils. The Chardonnay of Dispensa and Gurra also forms part of the La Segreta Bianco. The name is enough to prove the ancient links of this vine with Sicily, who saw it arrive with the Greeks more than two thousand years ago. 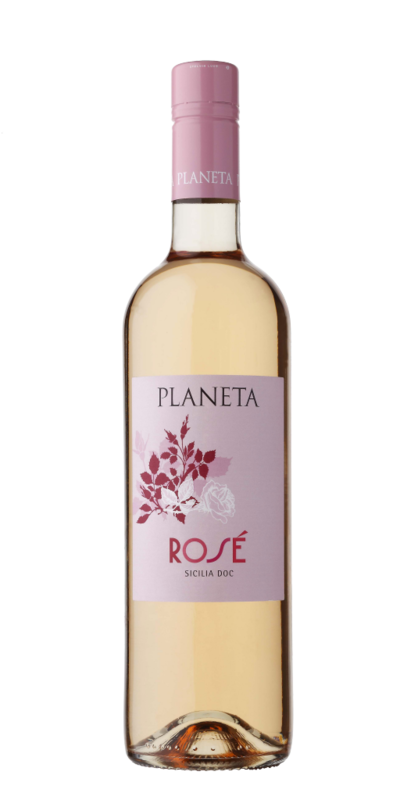 It provides the soul of our Alastro, which is one of the wines historically linked to our name. Recently we have used it in small amounts together with Grillo and Sauvignon Blanc. The Grecanico from Dispensa and Gurra instead forms part of the blend of La Segreta Bianco. Years of experience have helped us to identify among the vines at Ulmo, on the banks of Lake Arancio, the ideal place for the cultivation of this old French variety. Today the site of the Ulmo Merlot, producing a single-variety wine, is one of our single-variety vineyards. We have allocated small areas of the Dispensa and Gurra vineyares to this refined French vine with very pronounced aromas, which has always been in the ‘recipe’ of our La Segreta Bianco. We cultivate Nero d’Avola in its country of origin, in eastern Sicily, but we wanted to give it another interpretation in western Sicily, making the most of the soil of Maroccoli. We produce Plumbago here, a single variety Nero d’Avola completely different from the Santa Cecilia produced at Noto, and because of this unique of its kind. The Nero d’Avola from Dispensa and Gurra forms part of the La Segreta Rosso and of Rosè. Syrah is a noble Mediterranean variety which gives of its best in light dry places, just like the Maroccoli vineyard. Here we produce our interpretation of Syrah in a modern key, created from a single variety grown in a single variety vineyard. The Syrah of Dispensa and Gurra instead makes part of the blend for La Segreta Rosso and the Rosè. 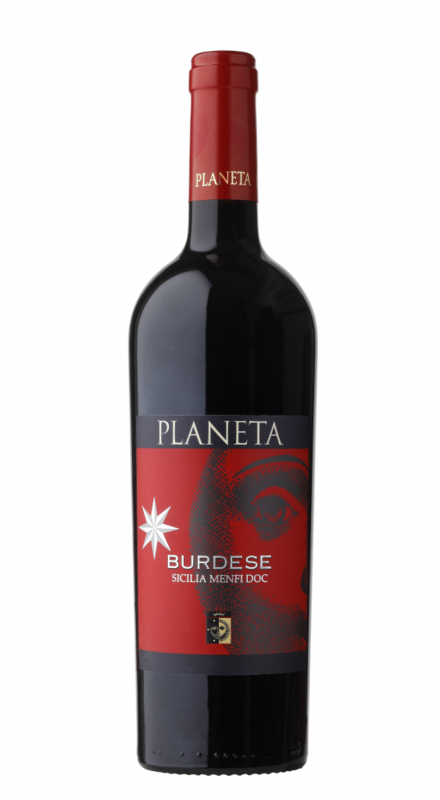 Two of the great French red wine varieties, Cabernet Sauvignon and Cabernet Franc, find ideal conditions in the Dispensa vineyards, expressed in particular Sicilian mode in the blend which constitutes our Burdese. A small part of Cabernet Franc also enters into the La Segreta Rosso blend. We cultivate Nero d’Avola in its country of origin, in eastern Sicily, but we wanted to give it another interpretation in western Sicily, making the most of the soil of Maroccoli. 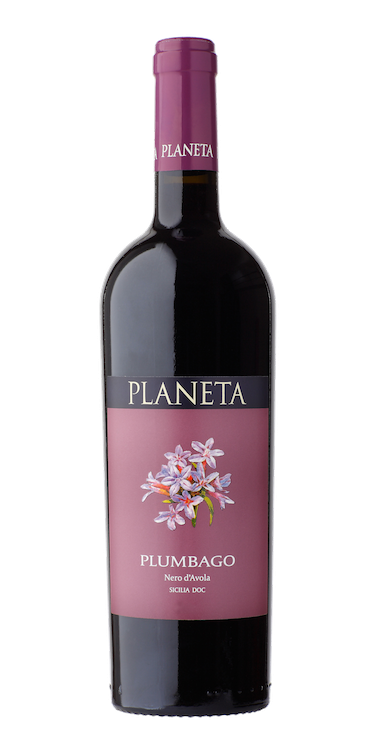 We produce Plumbago here, a single variety Nero d’Avola completely different from the Santa Cecilia produced at Noto, and because of this unique of its kind. The Nero d’Avola from Dispensa and Gurra forms part of the La Segreta Rosso and of Rosè. Two of the great red varieties of French origin, Cabernet Sauvignon and Cabernet Franc, find ideal conditions in the Dispensa vineyards, expressing in a particularly Sicilian way the blend which constitutes our Burdese. In the 1990’s we began experimenting with Fiano, a noble and ancient vine variety originating from Campania. Thus our Cometa arrived, which best expressed the characteristics of this extraordinary variety in a unique and original way, and in a Sicilian mode. 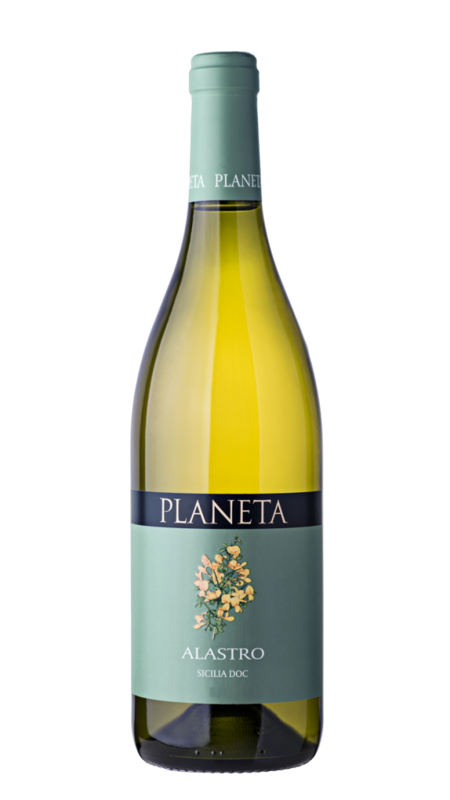 The Fiano cultivated at Dispensa instead forms part of the blend of La Segreta Bianco. The name is enough to prove the ancient links of this vine with Sicily, who saw it arrive with the Greeks more than two thousand years ago. It provides the soul of our Alastro, which is one of the wines historically linked to our name. 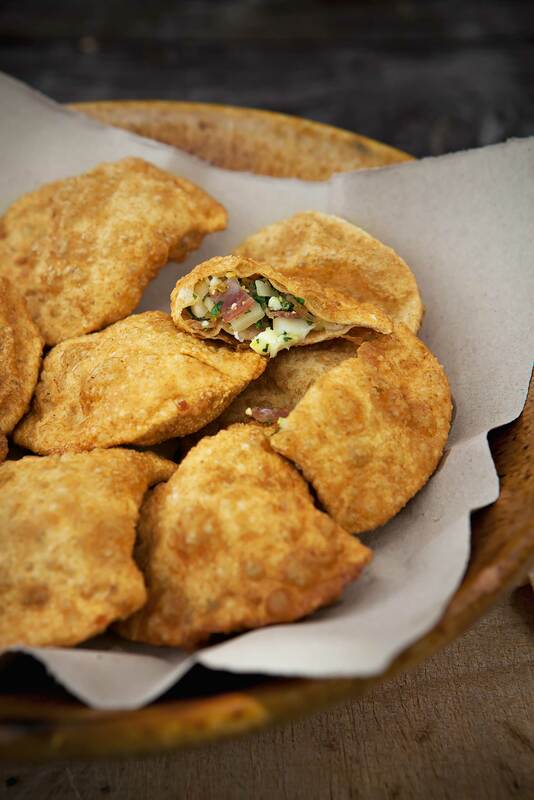 Recently we have used it in small amounts together with Grillo and Sauvignon Blanc. The Grecanico from Dispensa and Gurra instead forms part of the blend of La Segreta Bianco. This was the first vine we planted in 1985 in the Ulmo and Maroccoli vineyards, unique in their aspect and the characteristics of the terroir. It represents our history and also the vocation of our wine production, with the intention of recovering local varieties but also to demonstrate the extraordinary adaptability of the great international varieties to Sicilian soils. The Chardonnay of Dispensa and Gurra also forms part of the La Segreta Bianco. In the 1990’s we began experimenting with Fiano, a noble and ancient vine variety originating from Campania. Thus our Cometa arrived, which best expressed the characteristics of this extraordinary variety in a unique and original way, and in a Sicilian mode. The Fiano cultivated at Dispensa instead forms part of the blend of La Segreta Bianco. Built in 1995 on the banks of Lake Arancio, the Ulmo winery was the company’s first. Most of the company’s production originates from Dispensa, where we have built two wineries. The structure was designed to be architecturally in accord with the territory and the traditions of the area. The ground floor, with its fermentation vats, faces directly onto the vineyards and the lake. The large cellar has more than 700 barrels underground, where some of our most representative wines are matured, including the historic Chardonnay. The ‘pupitres’ are kept here for the production of our Brut Metodo Classico, with Carricante grapes arriving from Etna. The Cantina Piccola, in operation since 2001, is dedicated to the production of red wine; underground we keep about 900 barrels for maturation. The Cantina Piccola also contains the Infernotto, the caveau where we keep a selection of the best labels from all over the world and also a collection of all our vintages, to enable us to follow their evolution over the years. The Cantina Grande was completed in time for the 2005 harvest and is intended for vinification in stainless steel, following rational and modern techniques in order to obtain the best quality. These are some of the wines which have made history for our company and carry the name of our family throughout the world: from Chardonnay, symbol of our production and of the winemaking renaissance in Sicily, to Cometa, the great white wine of south Italy and result of our experiments with Fianco; from Alastro which best expresses the characteristics of an ancient indigenous grape like Grecanico, to La Segreta, faithful companion for everyday drinking; passing through the single variety Merlot and Syrah vineyards, to Menfi among the Dispensa and Ulmo vineyards. 500 g / 1 lb. oz. 400 ml / 13 1/2 fl. oz. 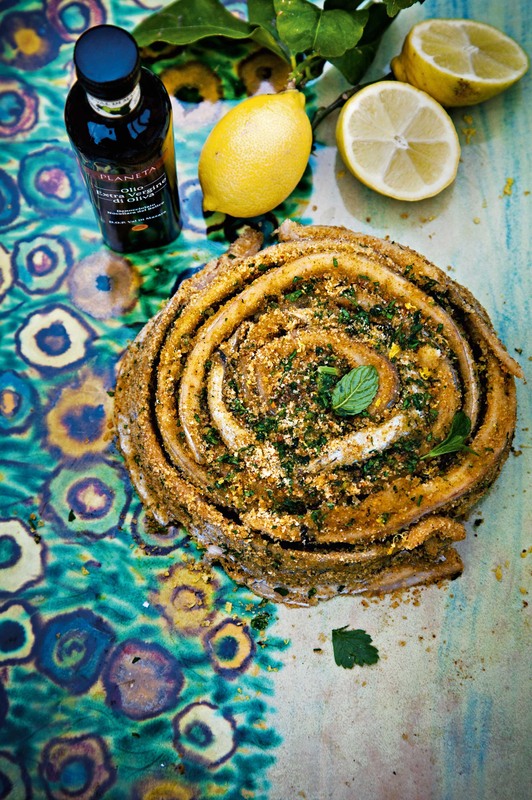 To make the coating, combine the minced aromatic herbs, breadcrumbs, lemon zest, salt and pepper. them loosely. 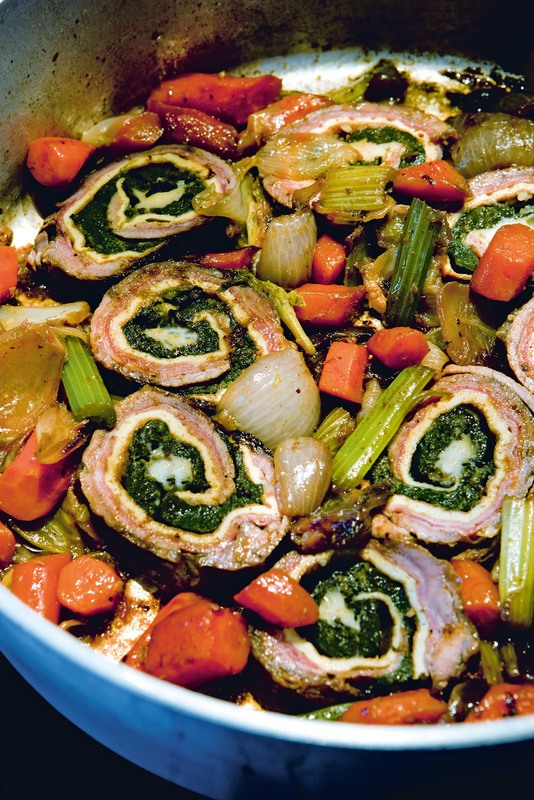 In a well-greased baking dish, arrange them snugly in a wheel shape. Bake at 180°C (350°F) for about 15 minutes. Cut off the fish heads, then open up the fish and remove the backbone. Marinate in water and vinegar for about 1 hour. Meanwhile, toast the breadcrumbs in a pan, careful not to burn them. When the breadcrumbs are a golden brown, drizzle with oil and blend well. In a bowl, combine the raisins, pine nuts, sugar, salt and pepper, the minced parsley, and the lemon and orange juices. Blend all the ingredients well, then spoon some filling inside each sardine. 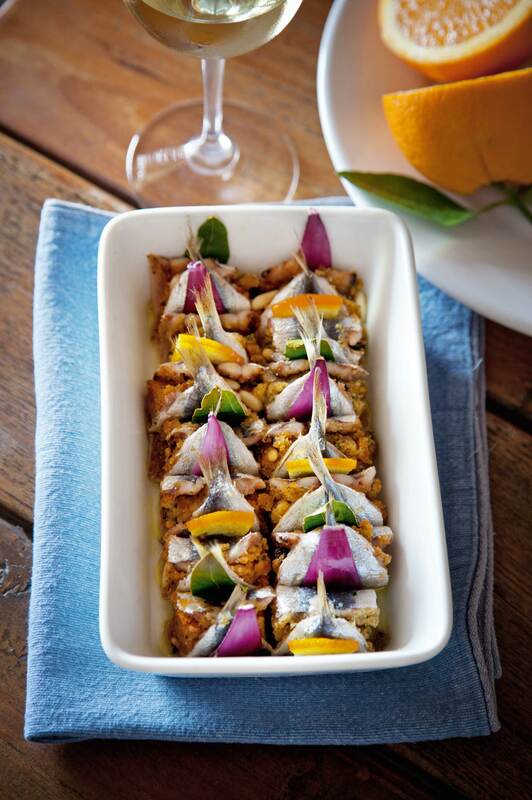 Roll the sardines to make involtini (rolled and stuffed fish). In a greased baking dish, arrange them snugly with a bay leaf in between each one. Drizzle with oil and some lemon or orange juice. Sprinkle with breadcrumbs and bake in a hot oven for about 5 minutes. Grease a large baking dish and coat with breadcrumbs. 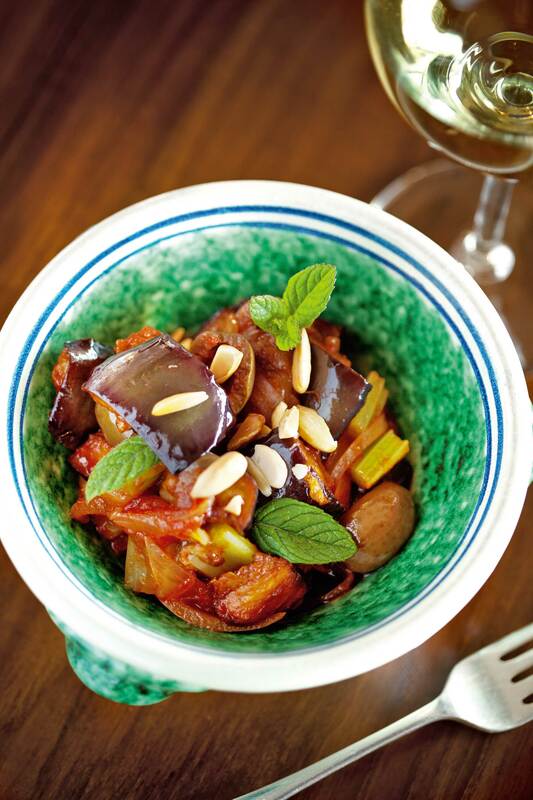 Slice the eggplants and fry them in extra-virgin olive oil. Bring a large pot of lightly salted water to boil and cook the capellini until al dente. Then drain and season with cold tomato sauce, butter and some of the grated Parmigiano Reggiano. Cut the Primosale cheese into thin slices. Cover the bottom and sides of the baking dish with the seasoned capellini. At the center of the capellini, arrange the eggplants, Primosale cheese, grated Parmigiano, basil leaves, tomato fillets, alternating the ingredients until you have used them all up. Use mozzarella for the middle layer to get a “stringy” effect. Cover the filling with the remaining capellini, sprinkle with Parmigiano and breadcrumbs, cover with foil, and bake at 190°C (375°F) for 45 minutes. Remove the foil and bake a further 10 minutes until a crust forms. 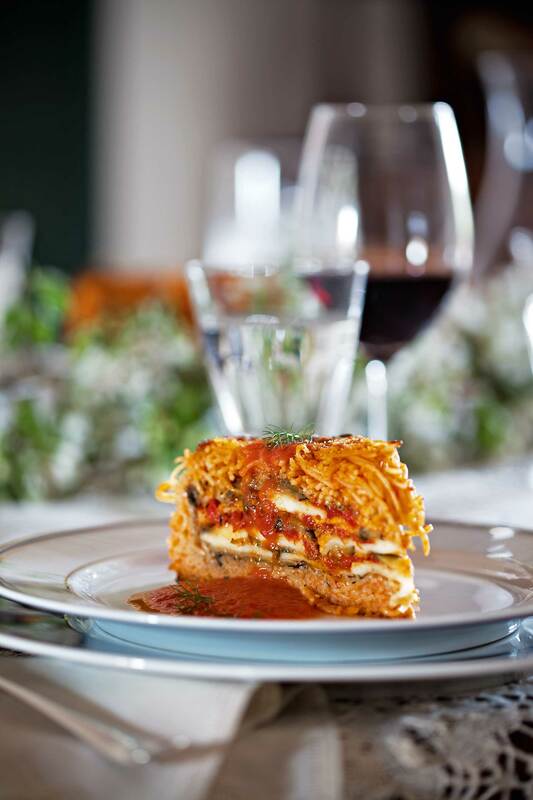 When the timballo is ready, set it aside for 10 minutes, then turn it out onto a platter. Serve sliced, preferably accompanied by hot tomato sauce and basil leaves. Make a vegetable stock with the celery, carrot, onion, salt and a few peppercorns. In a large saucepan, a copper one would be ideal, put in the rice and let it toast, stirring gently with a wooden spoon. As soon as the rice is hot (you can use your hands to check! ), pour in the wine and let bubble up until the alcohol evaporates. Start to add the stock to the rice, a ladleful at a time, stirring occasionally. Wait until each addition of stock has almost evaporated before adding the next ladleful. In the meantime, grate the Ragusano. When the rice is ready (after about 8 to 10 minutes), remove from the heat and add the grated Ragusano. Stir well. 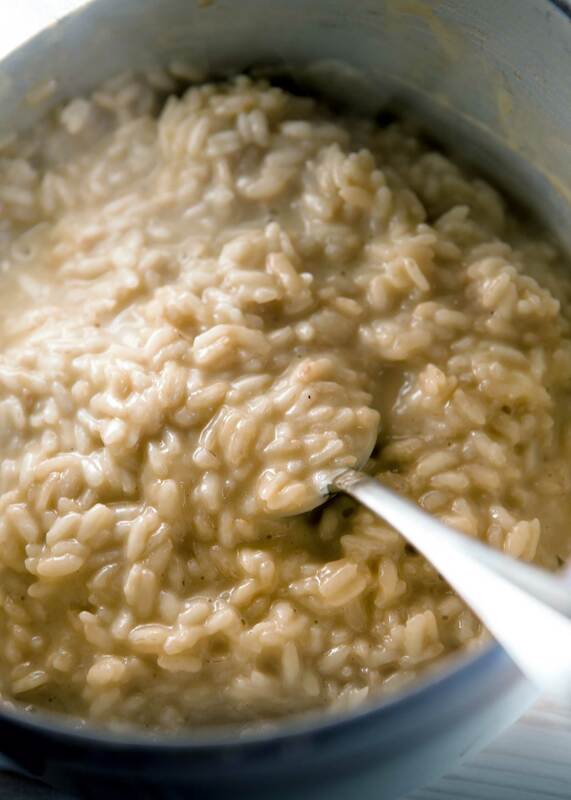 If you think the risotto isn’t creamy enough, add a little more hot stock. Cut off the fish heads, then open the fish up and remove the backbone. Rinse the fish, pat dry and put them still opened out on a paper towel. In a pan, toast the breadcrumbs with a drizzle of oil. As soon as the breadcrumbs start to brown, remove them from the heat and pour them into a bowl. Remove the backbone from the anchovies, then chop. In a bowl, combine the breadcrumbs, anchovies, Pecorino, grated rind of ½ lemon, parsley, chopped capers, nutmeg, salt and pepper. Blend the filling well. 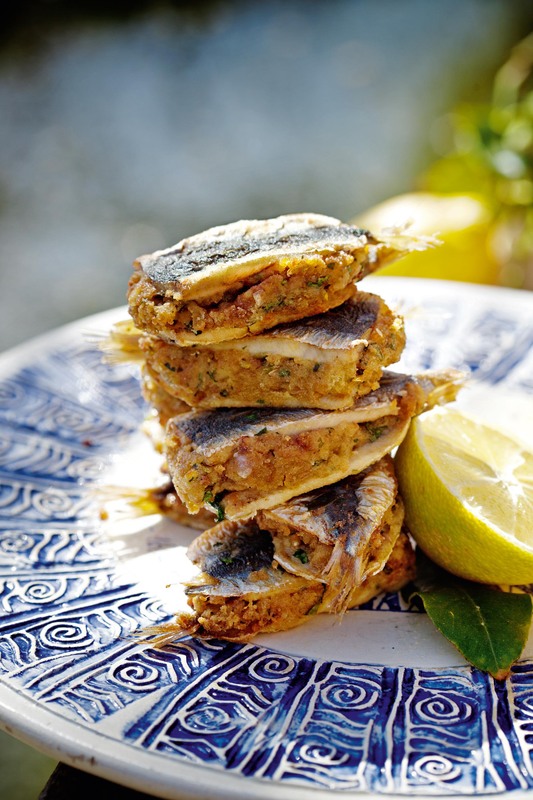 Drop a teaspoonful on each open sardine. Then take another sardine and top it as though you were making a sandwich. In a greased pan, arrange the sardines vertically, separated by bay leaves. Heat the oven to 180°C (350°F) and bake for 20 minutes. Serve while hot. In a bowl, beat the eggs with the grated Pecorino. In a frying pan, make 2 thin frittatas. In a pan, heat the spinach with a tablespoon of oil. Arrange the slices of meat to make a rectangle measuring about 30 × 20 cm (8 × 12 in.). Top with the baked ham, frittatas, spinach and, last of all, the slices of Ragusano cheese. Starting from one of the long ends of the rectangle roll into a log and tie with butcher’s twine at least a couple of time. In a pot, place the meat, celery, carrots, onions and oil. Brown over medium heat. Increase the heat, add the wine, and let it bubble up until the alcohol evaporates. Cook for a further 25 minutes, adding water if necessary. Wash the eggplants, cut them into 1-½-cm (¾-inch) cubes, sprinkle with sea salt, then place in a colander for about 30 minutes. Rinse and dry the eggplants, then fry them in a generous amount of olive oil. Wash the celery, remove any tough strings and chop. Bring a pot of unsalted water to boil and blanch the celery for 2 minutes; then add half the olives and the capers. After 4–5 minutes, pour the vegetables into a colander and drain. Heat some oil in a pan. Let the onion soften over low heat, but don’t let it brown. Add the chopped celery, the capers, the blanched olives, a pinch of pepper and cook for 2 minutes. Add the tomato paste and stir. Increase the heat. In the middle of the pan, make a well and pour in the sugar. Let the sugar dissolve, then add the vinegar and cook for 2 to 3 minutes. Pour the condiment over the eggplant. Do not stir the mixture until cool. Sprinkle with crushed toasted almonds and mint leaves. Combine the flours and the lard. Add a glass of lukewarm water and the two tablespoons of vinegar to make it easier to knead the mixture. When the dough is smooth and firm, let rest for 1 hour. Dice the salami and Provola and crumble the boiled eggs. Roll the dough out until it’s thin, then use a pastry cutter to make disks 10 to 15 cm (4 to 6 in.) in diameter. Place the filling at the center of the disk and fold over to make a ravioli. Heat the oil. When hot, fry the panzerotti, using a spoon to keep them covered in oil. Serve piping hot. During the history of our company, the establishment of each estate has always been accompanied by a specific hospitality project. For twenty years we have welcomed visitors to Ulmo, inviting them to discover where their favourite wines are hidden, while Dispensa has been reserved for exclusive events. After a tasting there are several different ways to proceed; from a simple aperitif with selected local products to a Casa Planeta lunch with dishes prepared in our family kitchen such as caponata (stewed aubergines) and panelle (chick pea fritters), timballi (baked pasta) and arancine (rice balls) to a typical cassata (ricotta cake), all prepared according to old recipes and notions handed down for generations. At Ulmo you can visit the remains of the ancient Phoenician wine press and explore the Iter Vitis museum, surrounded by the ‘collection’ of different Sicilian and Georgian vines, with which we intend to enhance the rich Sicilian winemaking culture.